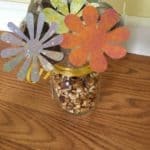 Today we have an easy and cute gift idea for Mother’s Day or any occasion: Teacher’s Appreciation Day, Get Well Soon, even May Day (who remembers actually leaving potted flowers on neighbors’ doorsteps, ringing the bell and running on May 1st? That never happens anymore!) 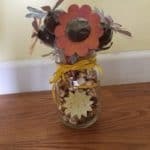 I love making homemade gifts for people simply to brighten their day. And a bouquet of “flowers” that is actually chocolate – I think that would put a smile on most people’s faces! My mom recently made this for Administrative Assistant’s Day at her school. Everyone was supposed to bring in a flower but she made her own and it was fabulous! And super easy. Let’s unpack it and see what’s all in it! Start with a clean Mason Jar or any clean jar would work. I never throw away my jars – pickle jars, jelly jars, spaghetti jars, especially if they have a good lid. They can always be repurposed for nice gifts later. Next, fill it up with Cracker Jacks – this is your “dirt”. The stems of the flowers will be from Cake Pops. There’s a great step-by-step video of how to make cake pops from a previous post. My mom would probably disagree but I think you could use lollipops here if you didn’t want to make your own cake pops! Or you could buy them from Starbucks, I’m not sure where else you can buy them in Kansas. Next, to make them look like flowers, you need to cut out flower shapes from cardstock or scrapbook paper. 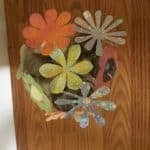 It is easiest to do this if you have a scrapbook flower punch. 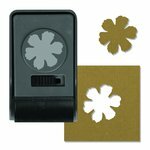 Investing in a couple good quality paper punches is a great idea if you do very many crafts. I’d suggest a flower, heart, and a Christmas tree at a minimum. You can make endless craft projects, cards (Valentines, Christmas, Birthday), and it comes in very handy for kid’s school projects. Below is an example of cardstock punch. If you don’t have a punch then you can totally free-form it – just cut a flower that is big enough so you cover the cake pop. Remember this is your “flower” part so it should be pretty and the eye-catching piece. Grab some scrapbook paper that is a color that coordinates well or works with the colors of the season. If it’s Christmas – poinsettias would be beautiful! Use poinsettia scrapbook paper to make the flowers! Once you have your flower cut out, you are ready to tape it to the top of each cake pop (make sure you have wrapped those cake pops in bags!) and hide the rest of it to make it look like a bouquet in the jar. Lastly, tie a ribbon around the front and fun sticker in the middle (or maybe a small card.) Give it your personal touch!